Is Roy Oswalt a Sell-High? By all accounts, Roy Oswalt is dealing. He’s got an ERA under three, a good WHIP, and is pitching for a contender that should get him wins. If you drafted him to be your number two, you’re probably happy with his performance. Why should you consider selling high on the second-best Roy in Philadelphia? In a word, swinging strikes. The average swinging strike rate across baseball is usually around 8.5% in any given year. Oswalt has been average or better in the statistic for eight of his last nine years, and that’s how he’s built a strikeout rate that’s usually average or better. 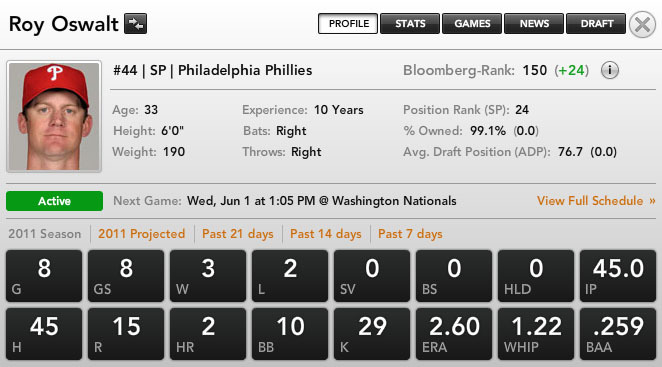 This year, Oswalt has a 6.9% swinging strike rate, the lowest of his career, and far below average. That’s behind his 5.8 K/9, again the lowest of his career and far below the 7 K/9 that is average across baseball right now. There are other facets to pitching well. Oswalt still has his patented control, as his two walks per nine inning show (3.25 BB/9 is average this year). That should continue, and it will help him keep his WHIP and ERA manageable even if he regresses. He just won’t have a ton of baserunners even if he isn’t racking up the strikeouts. Oswalt also gets about half of his contact on the ground, which is ahead of the 44% league average. But that’s not an elite ground-ball rate, and it’s not enough for him to ‘deserve’ his current home run rate. He is giving up the fewest home runs of his career in Philadelphia (0.4 HR/9 this year, 0.76 HR/9 career). This is because only 4.5% of his fly balls are leaving the park. That number trends towards 10% yearly across baseball, and Oswalt himself has an 8.9% number in the category. More home runs are coming. At 33 years old, there’s a little less gas in Oswalt’s tank. He’s lost a tick off his fastball (down to 91+ MPH from 92+ MPH) and he’s foresaken the slider so far this year. He’s using the slider 5% of the time after using it around 15% of the time the last three years. Sliders are known to cause stress on arms – but we haven’t heard from Oswalt that his arm is hurting. His back was the issue earlier in the year, but that’s just the sort of thing he’ll deal with as he gets older. The point is, he doesn’t look like a true-talent mid-twos ERA guy at this point in his career. He’s not getting the swinging strikes, and some luck is covering up his lack of strikeouts. He’ll be good going forward – don’t sell him too low. But consider an ERA in the high threes much more likely from this point on. That means that if someone is willing to pay ace prices, you should listen.